UPDATE: (March 2008)in several colors to satisfy the request with a friend. 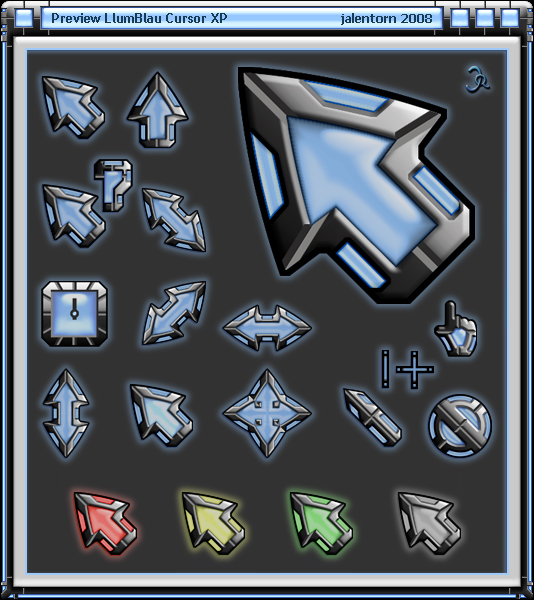 Great cursors jalentorn, is this the start of another great suite. This is great..pretty blue and nicely animated. Thanks to all for your words. Cavan1, Apocalypse 67 and Boss019, you win, there will be suite for my friends. Very nice theme! Goes great with the Luna Alt WB skin I'm currently using. very nice.I'm waiting for the rest of the suite. This is just beautiful work man! I'm using the cursor now, and i think im hooked. I usually like more simplistic ones, but this is just awsome!!!! Increible no habia tenido tiempo para darle nuevamente mis agradecimientos por este trabajo, se merece 5 estrellas, no conozco photo shop pero me imagino que es un duro tabajo hacer esto en ese programa, a mi me gustaria aprender a aplicar el efecto de cristal o glass, que utilizaste en este cursor, estoy buscando informacion porque me gustaria hacer mi primer Windowblinds, ya tengo skinstudio pero no se como crear botones en cristal. Gracias por el comentario. Ya te he escrito directamente un e-mail para intentar ayudarte. The suite looks great, using the WB now. I like the update to the cursors, very nice. Thanks Cavan1, I always complete my promises. . I freaking LOVE everything about this cursor. Becomes my default. THANKS!!!! !